Fan enthusiasm is conveyed in a number of ways. While once all people did to show their love for a film or franchise was by purchasing tickets to the movie, now the method of displaying their fandom is a lot different. We’ve got comic conventions, cosplays, marathon events, and much more. Simply watching a film is doing the bare minimum if you consider yourself a true fan. There are a lot of outlets people have used to showcase just how much they loved a piece of media. In more ways than one, these outlets can bring out the best from a fan. For instance, there is fan art; a type of outlet that showcases the imagination of a fan. Fan works aren’t entirely new but they usually feature so much originality that the concept hasn’t gotten old yet. With the advancements in technology, graphical works by fans are way better than what studio films had delivered to us years before. It’s a pleasure to view these works as they convey to us the level of dedication a person has put into their art. People don’t make any money from these things – or at least that’s not the case when they start out – it is mainly a representation of how much they enjoy these works. A unique point of view offered nowadays is the gender swapping of a famous character. This shows us a character in an alternate light. You’ll find yourself wondering how the personality of said character might change had they canonically been swapped for a different gender. With that in mind, here are 20 Marvel Characters Reimagined As Girls. Captain America is the Sentinel of Liberty. The man knows no fear; whether it is someone as lowly as an alleyway bully or a megalomaniac A.I. like Ultron, or a Titan like Thanos. These qualities make him stand out as a hero, with or without his powers. If Captain America were to be a woman, you can bet your bottom dollar she would have been just as inspirational. Without a doubt, she would have pioneered women to be fighters in World War II, and would have been the leader of the Avengers regardless of gender. Marvin Pham imagines a Captain in the heat of battle with her shield in tow. Ant-Man has always been frantic in battle. Scott Lang was never a fighter, nor will he ever win awards for bravery. The Ant-Man suit allowed him to think of himself as more than a common criminal, however; despite retaining that sense of helplessness in battle. Neo Art Core shows us a female Ant-Man – or perhaps we should call her Ant-Woman – who looks just as lost as Scott would when battling enemies. You can still be certain, though, that she would never abandon her teammates the way Scott remains dependable as ever. Neo Art Core gives us a version of the Winter Soldier who is still brainwashed by HYDRA but belongs to the opposite gender. If you think about it, this would have given us a mouth-watering opportunity to see the Winter Soldier face off against Black Widow at even odds. Although she would still have an advantage due to the Super Serum, we always consider the male Winter Soldier to be a contrast to Captain America. A female Winter Soldier would’ve been Black Widow’s arch nemesis. The dynamic between her and Captain America would certainly have not been anywhere near what the canonical version is either. In Avengers: Infinity War, all of Thor’s good efforts in Thor: Ragnarok were undone due to Thanos’ intervention of the Statesman ship. Carrying on his losses from Ragnarok, Thor ended up losing his home planet, his father, his sister, his people, and his brother. The wounds of war cut deep; these were all emotional rather than physical. Neo Art Core's female Thor is as fierce as the male one was in Wakanda in Avengers: Infinity War. However, you get the sense that a female Thor wouldn’t have been as overly emotional as the canonical one and might have aimed for the head rather than the torso when attempting to take out Thanos for good. The Thor we saw in Thor: Ragnarok was much different from the one in the films before. From his debut in his titular movie to Avengers: Age of Ultron, Thor was a lot brasher than he was later on. In Thor: Ragnarok, this was fully explained as Thor being completely reliant on his hammer, Mjolnir. Due to this, he began seeing himself as invincible. Judging by Lee Jeehyung’s illustration, the female Thor wouldn’t have been much different. She too holds firm Mjolnir in her grasp, even looking down upon it with a rather maternal gaze. The Winter Soldier went through several phases in his life before his demise in Avengers: Infinity War. At first, he was Bucky Barnes – the loyal friend and big brother figure to Captain America. In his next appearance, he was a brainwashed assassin, before going on the path to redemption in Captain America: Civil War. Finally, he was part of the hero group in Avengers: Infinity War. Illustrated Kate’s interpretation of a female Winter Soldier is the cured version as she sports Wakandan garb and has a smile on her face; something the male version never displayed after Captain America: The First Avenger. We can all agree that no matter what version of Iron Man wears the suit of armor, if it is supposed to be a variant of Tony Stark then that person is heavily full of themselves and narcissistic. Even Neo Art Core’s female Iron Man – or Iron Woman – sports a knowing smirk. This sort of expression is generally found on Tony Stark’s face when he knows something others do not. Tony, or his female counterpart, may be smug and arrogant, but they are still filled with a sense of righteous purpose. Like her male counterpart, the Iron Woman would stand for what is right and would be ready to lay down her life for the good of all humanity. We got a sort of Female Wolverine in Logan in the form of his biological daughter X-23, but what would the landscape have been like if Wolverine himself were a woman? The rage that James Logan displayed during his time with and without the X-Men was of unprecedented levels, and it is difficult to imagine something of the sort on a woman. Had Logan been female, there could have been chances of a more sedate Wolverine. This illustration combines both Wolverine and X-23. It features a grownup X-23 clad in her father’s comic book outfit. How she carries herself is contingent upon the level of rage she inherited from Logan. Of the two Quicksilvers we have seen onscreen, the first debuting in X-Men: Days of Future Past and the second in Avengers: Age of Ultron, there won’t be any difficulty in determining the peoples’ favorite. The X-Men version had more personality and actually looked like someone who knew how to use his powers. This is why Infinityandbeyond chose to go with this version to be interpreted as a female rather than the Avengers one. If we’re being honest, seeing Quicksilver as a girl, at least how she’s illustrated here, fits perfectly. Had there been a Quicksilver as a woman from the get-go in an appearance such as this, we’d have been onboard with no complaints. When was the last time Magneto ever cracked a smile? In X-Men: First Class, Magneto was shown much happier than we’ve ever seen him in all the X-Men films, largely due to the presence of Professor X around him. Other than that, Magneto has always been a somber individual whose antagonism toward the human race consumes everything about him. 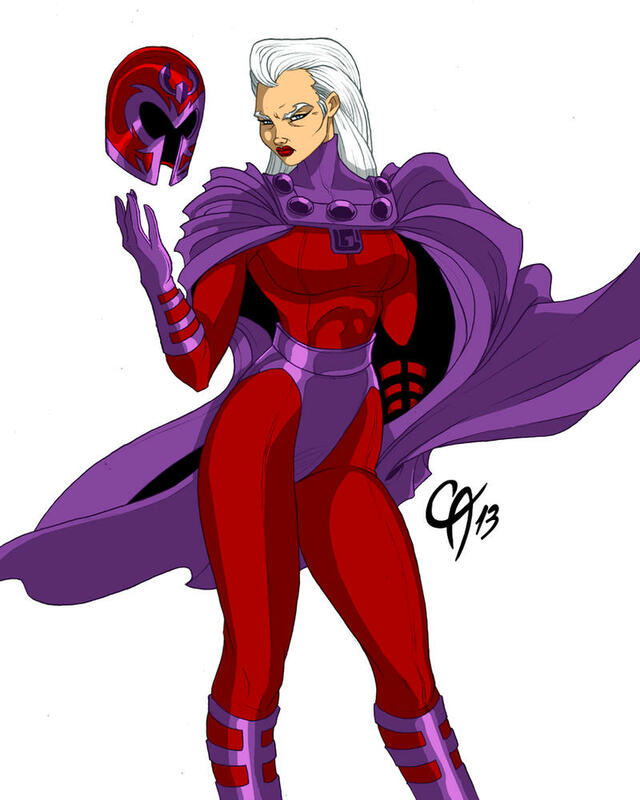 A female version wouldn’t have been any better according to cahnartist, who sketches a woman Magneto. She still carries the same frown her male counterpart is known for while tossing the signature helmet up and down. You can’t mention Magneto without Professor X being right around the corner. In the prequel X-Men films, Professor X is more well-known by his actual name of Charles Xavier, and this is the name we would also call him by if he displayed such a casual nature as in this picture. Then again, Thacmis has intended for the Xavier in this sketch to be a woman. Wearing something one expects from a Snapchat filter on her head, this Xavier is different from ours in that she is completely happy. Xavier always burdens himself with his pupils and friends’ problems, but here the female Xavier is at peace. In Thor: Ragnarok, we got the main villain in the form of Hela, the Goddess of Death. She resembled Loki greatly, so much so that Thor looked like the adopted sibling rather than Loki. The resemblance was due to the source material having featured Hela as the daughter of Loki. Who needs Elektra when you’ve got a female Daredevil? One of Matt Murdock’s greatest weaknesses has been his love for Elektra; something that has been exploited by his enemies and Elektra herself. Had Daredevil been a woman, the Elektra factor would not have come into play. Then there’s the fact that everything we know about Daredevil would’ve been changed. There’s no way the characterization Matt Murdock went through would’ve been the same for a female counterpart. It’s unclear how the female version might have conducted herself or even reached the point where she donned the Daredevil mask. Perhaps someone should be inspired by Marius Vanus’ illustration and make a female TV show. Chris Evans is only remembered as the Human Torch by older fans such as us who saw him in Fantastic Four and Fantastic Four: Rise of the Silver Surfer. It will take something truly special for the Fantastic Four to rebound from all the disappointing films they have featured in thus far. A female Human Torch will definitely not work out as any radical change, such as the one we saw with Michael B. Jordan taking on the role, will not sit well with fans. But, we can still appreciate this interpretation of a female Human Torch by Camp Half-Blood Role Play. In this era where the concept of the straight-laced superhero is seen as lame and uninspired, the Punisher is viewed on the top of the coolest heroes out there. For the most part, the Punisher isn’t even a hero considering the brutal ways he disposes of his enemies; the people still eat it up though, making him a de facto superhero. A female version might possibly be more popular considering the movement of female-driven superhero films in the process. 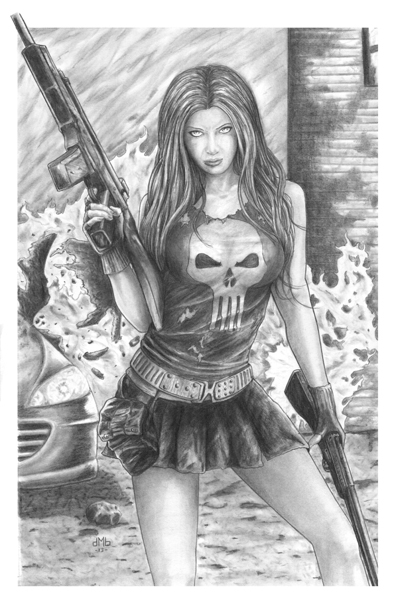 A woman who destroys her foes with lethal force – especially the brutal methods the Punisher uses – will be something new entirely. Illustration by David Bancroft. Before you start whining that Robocop isn’t a Marvel character, go and do a little research and you’ll find that Marvel did publish issues of Robocop from 1990 to 1992. Robocop has been a topsy-turvy affair for his appearances in media. There’s always the sense the character has never delivered on expectations. Robocop has never been a runaway success and has been rebooted on occasions hoping for fan approval. Maybe a female reboot would go a long way in bringing in viewers. It certainly would be more interesting to watch a female adjusting to a life of a bionic person than a male. This illustration attests to how cool she would look, too. For most of his appearances, Cyclops has been an absolute whiner. He always has the romance of Jean Grey in his grasp but remains wary of Wolverine’s interest in her. The love triangle has hardly been engaging, and while Cyclops is the deserved person to hold Jean’s love, his constant insecurity makes him rather unlikable. As a girl, though, Cyclops might have more role to play than being a love interest to Jean and foil to Wolverine. Who knows, perhaps the lady Cyclops might end up being a more engaging character than the other female X-Men. Mike Ballen’s interpretation certainly has a cool look. Women find the male version of Deadpool attractive already, even the charred face of Wade Wilson is alluring to them. Then it’s a no-brainer that this illustration by Jorge Lobo would be something the men would want to become a reality in live-action. A female Deadpool would be fun to watch simply because you just don’t expect a female character to behave the way Wade Wilson does. There would be room for a lot of originality here and even if doesn’t work out, an attempt wouldn’t be the worst thing to try. This sketch of the female Deadpool is cool looking enough for us to want a film version. The Mad Titan won the entire affair in Avengers: Infinity War, all thanks to the Infinity Stones. He had a calm demeanor for the most part and rarely lost his cool. Thanos made us see what an invincible villain would look like in the Marvel Cinematic Universe and his only vulnerable moments were when appealing to his daughter Gamora. Now, if there happened to be a female Thanos then the dynamic with Gamora would have seen a different turn. 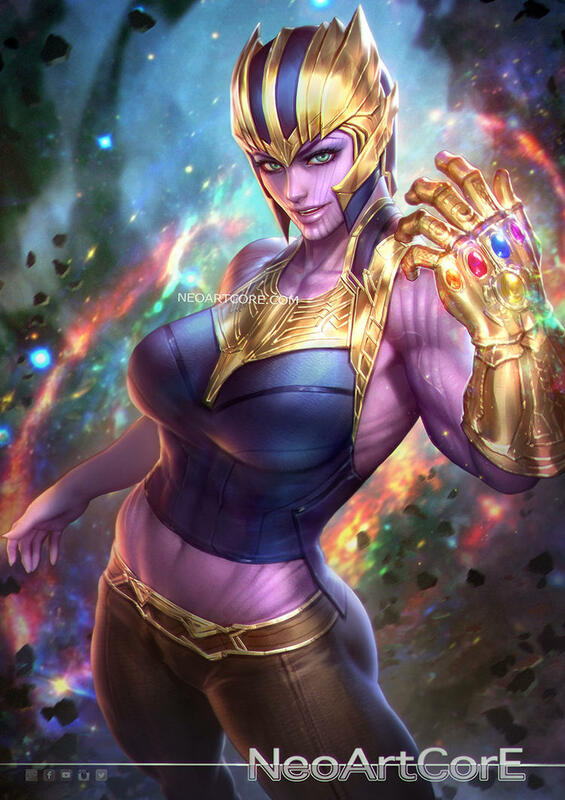 Most likely, she wouldn’t have taken it easy on Gamora as the male Thanos did. Perhaps the female Thanos as shown by Cecilosaurus would’ve been more ruthless than the one in Avengers: Infinity War. We all missed Hawkeye greatly in Avengers: Infinity War. Although the archer would most likely not have been a great asset against aliens from outer space, it was the fact that he completed the team that we missed. In Avengers: Endgame, Hawkeye will be back and this time he will be in his Ronin garb. Mohammad Ali Zahid, on the other hand, imagines Hawkeye as we've never known him to be: a woman. While she wouldn’t have differentiated in any way in contributing to the team, the female Hawkeye might not have had the same closeness with Black Widow as the male version. What do you think about these Marvel characters reimagined as girls? Let us know in the comments!